March 25, 1668: The first horse race in America takes place in New York at Salisbury Plain on Long Island. The grassy plain measured about 4 miles by 16 miles and easily accommodated the running of a two-mile course. All of this was done in the spirit of encouraging a better breed of horse, but trophies were awarded at the spring and fall meetings. Back in the mother country, King Charles II made horse racing popular after regaining the throne in 1660. Cromwell had banned racing, however Charles reopened New Market and encouraged the citizenry to attend races. He introduced the old Roman custom of racing silks and initiated the use of poles at furlong intervals. 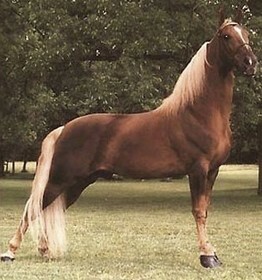 Narragansett Pacer was the first truly American breed of horse, and although its line is in doubt, the horse seems to be a cross between English and Dutch horses. The first breeding center was established in Rhode Island west of the Narragansett Bay, hence the name. Horses were used for industry and travel as well. The first use of horses to deliver the mail was on January 22, 1673 when mail service was set up between Boston and New York. Having well-bred horses helped to maintain the colonies that were spread over a vast area. Also on this day, in 1655, Christiaan Huygens discovered Titan, Saturn’s largest moon.